Unexpectedly at the Fundy Nursing Home, Blacks Harbour NB on January 13, 2019, Elsie, Elizabeth Mada (Ferguson) Oliver, wife of the late Andrew Boyd "Bill" Oliver formerly of Bethel NB. Born in Vermilion AB on November 4, 1934, she was a daughter of the late William and Edna (Davis) Ferguson. A loving mother, grandmother, great-grandmother and sister, Elsie is survived by two daughters: Martha (Brian) Barker of Canal NB and Ivy (Donald) Steinbring of Edmonton AB; two sons: Angus Oliver (Norma Leslie) of St. Stephen NB and Robert (Peggy) Oliver of Thorsby AB; 10 grandchildren; Bryan James (Tabatha) Barker, Cheryl Lynn Barker (Nick Porter), Phillip Oliver, Cara (Tim) Doyle, Sarah, Scott, Shane and Madeline Steinbring, Robert and Michael Oliver; seven great-grandchildren; two sisters: Winnifred (Frank) Duddy of Alberta and Joan Jones of British Columbia; one brother: William "Bill" (Angie) Ferguson of Alberta; several nieces, nephews and cousins. In addition to her parents and husband, Elsie was predeceased by an infant son: Thomas William Andrew Oliver; and two sisters: Isabel Ferguson and Diana Potopoff. Elsie came to New Brunswick from a large farm in Vermilion AB. As the oldest child who lost her dad at a young age she became an instant parent to her younger siblings. 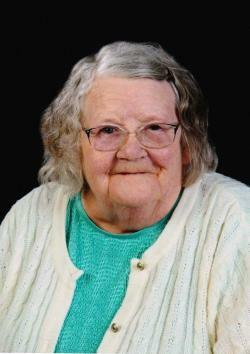 She was an avid outdoorswoman who loved farming, haying, blueberrying and gardening. She was a loving soul who especially enjoyed spending time with her family. Elsie was a very active member in the Church of Transfiguration in Bethel. Arrangements in the care of the St. George Funeral Home (755-3533) 26 Portage Street, St. George NB. Resting at the funeral home on Wednesday from 2-4 and 7-9 pm. The service will be held at the Church of Transfiguration, Bethel NB on Thursday at 2:00 pm with Rev. Mary Ann Langmaid officiating. The interment will be held in the church cemetery in the spring. In Elsie's memory, donations to the Church of Transfiguration or to a charity of the donor's choice would be appreciated by the family.